Child-friendly?Cop Out is about two New York City police detectives and longtime partners that suddenly get suspended and have to find a way to make money. 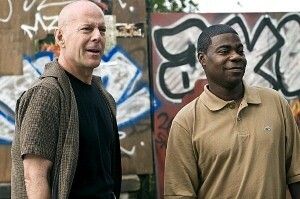 Fans of other police partner action and comedy films like Die Hard, 48 Hours and Lethal Weapon may be drawn to the film, which stars Bruce Willis and Tracy Morgan. Parents should know, however, that Cop Out is rated R and scenes contain a lot of violence, vulgar language and sexual references. These factors make the film inappropriate for children under the age of 17. Cop Out is the story of two longtime NYPD partners, Jimmy and Paul, who get suspended without pay after a botched operation. Jimmy is desperate to make money to fund his daughter’s dream wedding so he decides to sell a prized baseball card. When the card winds up in the hands of a memorabilia-obsessed gangster, the duo finds themselves following its trail. Meanwhile, Paul has a hard time keeping his mind on the work at hand because he’s preoccupied about his wife’s alleged infidelity. The film is directed by Kevin Smith, best known for movies such as Clerks, Chasing Amy, Jay and Silent Bob Strike Back and Jersey Girl. In addition to stars Bruce Willis and Tracy Morgan, the cast includes Adam Brody, Guillermo Diaz and Seann William Scott. Cop Out is rated R and contains a lot of sexual references and bad language, including many uses of the "f" word. The movie also has a lot of violence, with about a dozen gangland-type execution murders. The violent scenes are not overly bloody or graphic. While the film does have some positive themes including the importance of teamwork and family, the violence and language may make them difficult to pinpoint. Parents who choose to see the movie with their children may want to use it as an opportunity to start a discussion on the importance of good relationships.